Today I'm starting a new series called "Born on the Same Day", featuring players who were born on the same day (!) and year. The scope of this exercise is those players (or managers) who have cards in the 1965-1970 sets (because that's what I dooze). Ideally, I should also have their cards. 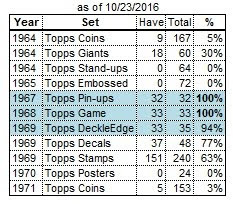 I am going to post these in chronological order, and distribute them across my 1966-1970 blogs depending on which cards I have for who. 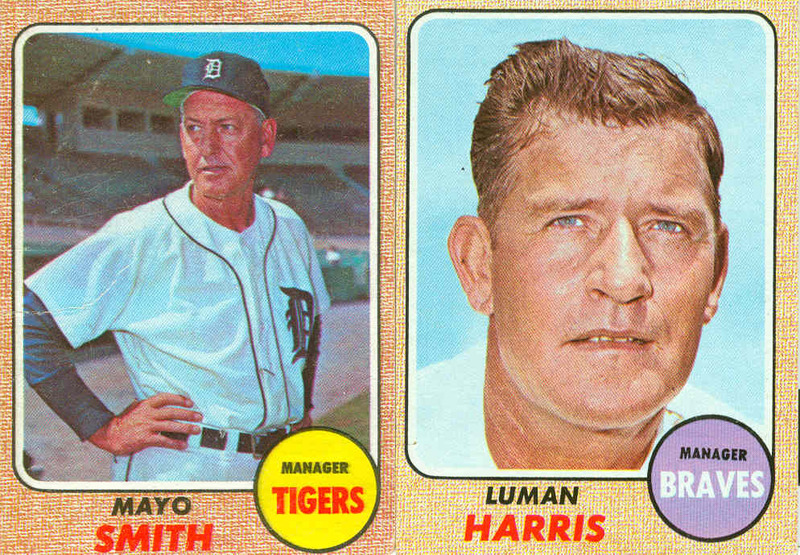 So with chronology in mind, first up is the only pair of managers: Mayo Smith and Luman Harris, both born on 1/17/1915. Lum Harris played for the Philadelphia Athletics from 1941 to 1946, except for the 1945 season while he was in military service. Coincidentally, Mayo Smith's only MLB season was in 1945... for the Athletics. So they missed each other by a year. This is Rich Rollins’ final card as a Twin. After the 1968 season he joined the expansion Seattle Pilots. Rollins was signed by the old Washington Senators in 1960. 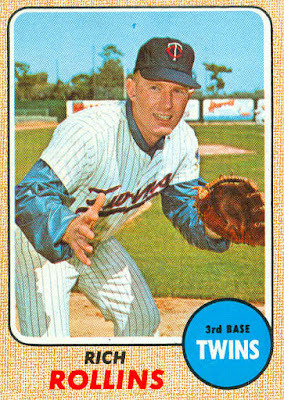 Midway through the 1961 season, he made his major-league debut for the team, in their first season as the Minnesota Twins. In 1962, Rich hit .298, collected 96 RBI, and made his only All-Star team, as he started 158 of the team’s 163 games at the hot corner (every game except the 5 from 9/13 to 9/18). 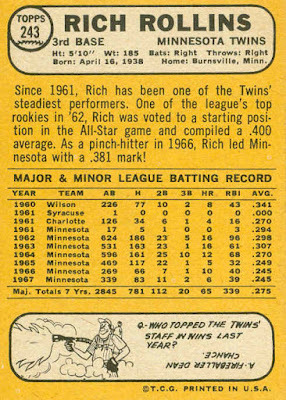 Rich was the Twins’ everyday 3rd-sacker for the next 2 years, starting 132 and 146 games there. In 1964 he led the AL with 10 triples. In 1965 his starts were down to 110 (plus 12 starts at 2nd base). 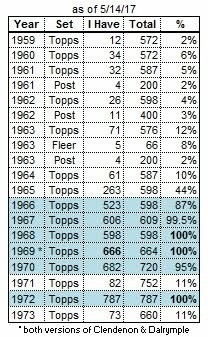 The decrease was due to Killebrew having moved in from left field beginning in 1965. Although Killer primarily played 1st base, he started 40 games at 3rd in an effort to keep Don Mincher’s bat in the lineup. Rollins’ days as an every-day player ended after 1965. Killebrew started 103 games at 3B, to Rollins’ 59 games in 1966. 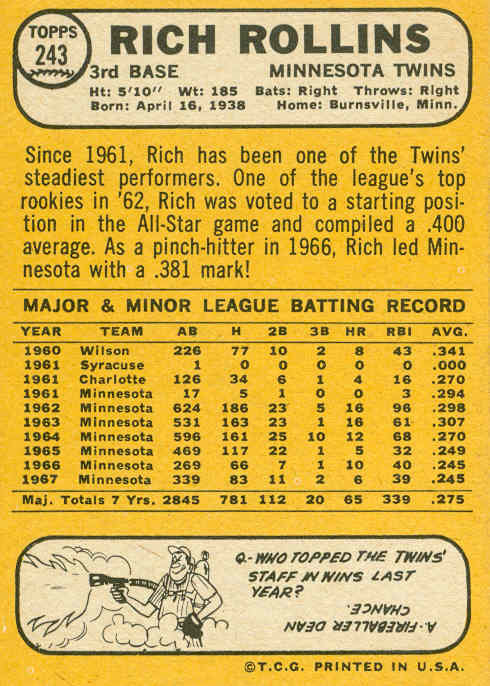 Still, Rich appeared in another 30 games as a pinch-hitter and defensive replacement. With Mincher shipped off to the Angels after the 1966 season in exchange for Dean Chance, Killebrew took up full-time residence at 1st base. Rollins benefited with 90 starts at 3rd base, while jack-of-all-trades Cesar Tovar started 56 games there. Rollins’ final season in Minnesota (1968) saw him relegated to the bench for all but 44 games, as Tovar became the primary 3rd baseman, and utility types like Frank Quilici and Ron Clark also getting some playing time. After the ’68 season, Rich was selected by the Pilots, and began the season as the starting 3rd baseman. He started 39 of the first 62 games there, then took a seat on the bench for the rest of the season. The team used a fleet of utility players there (Gus Gil, John Kennedy, Ron Clark) before settling on Tommy Harper for the final 2 months of the season. After playing only 14 games with the Brewers, Rollins was released in mid-May 1970. He was picked up on the same day by the Indians, and played 42 games (all but 4 as a pinch-hitter) over the remainder of his final season. He played in 1002 games over his 10-year career.